Push notifications are the trend now. They are not only proving to be the best way to deliver update notifications but also improves more engagement on blogs. It is good for every blogger to add push notifications on his/her blog from day one as it will help them to easily share update notifications with the readers even when they are not on your blog. 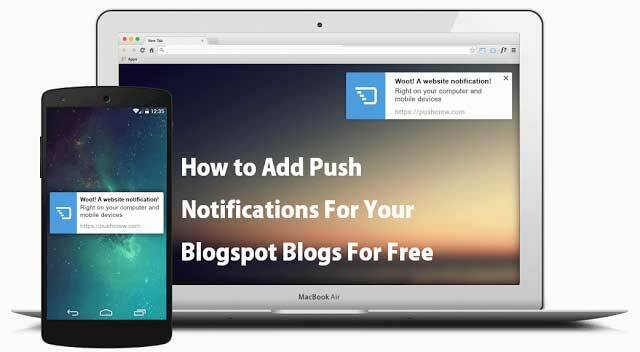 If you have a wordpress blog than it is really easy for you to Add push notification by using Wordpress plugin. But what if you are a blogger on blogspot platform. There is no plugin for blogspot platform. Don`t worry still I am here to help you to add push notification on your blogspot blog. You can now add push notifications on your blogger blog using code. It is really easy to install. You can use a third party service PushCrew. Enter your detail and blog url. Now you will get inside the dashboard. Now open your blog and you will see a push notification bar at the top of your blog. Currently the free limit is only for first 500 subscribers after that you need to upgrade the plan.